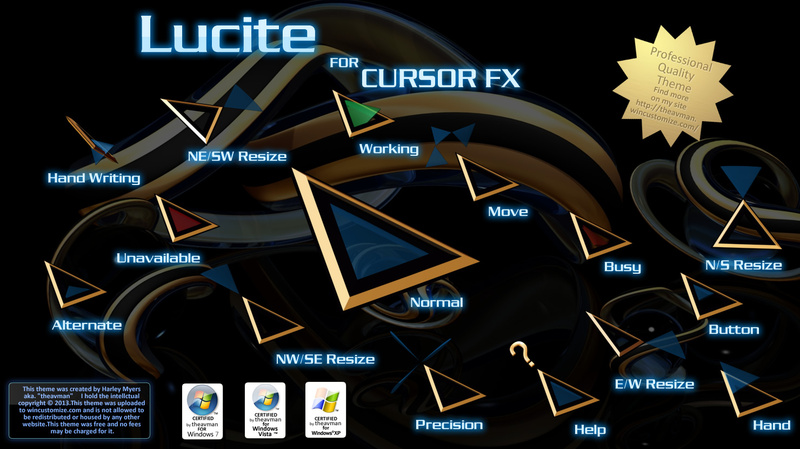 Lucite for CFX is an animated accurate cursor designed for easy usability. It has a small footprint and fast smooth animations. Harley!!!!! Where ya been, man!!!!!! Hey Jim , Whats up man? Just working alot these days! Nice Cursor's. Welcome back Harley. Dave Thank you my friend on both accounts! Amazing work! Excellent usability. Definitely one of your best. Thanks for sharing. Very cool Harley, thank you. [e digicons]5*[/e] from me!! Absolutely love it!! AV is it!! Does this mean there is a skin coming? Thank You very much ,glad you like it! Very cool Harley, thank you. from me!! Thank you very much Bryan,good to see you my friend! Absolutely love it!! AV is it!! Thank you sir,it means alot! A keeper. Like it a lot! Very nice indeed. Any thing else in pipes being worked on right now? but I only have time to work on them occasionally, thank you for the intrest!